Gentle - holds skin down as it pulls out the hair. Safe - the 32 tweezing discs do not come in direct contact with the skin. Quick - removes hair quickly by holding down the skin so shorter hairs can stand up straight. The epilation head moves side-to-side, removing shorter hairs more effectively. The epilator comes with a shaver head attachment to help keep your skin smooth and soft. There are no manuals currently available for this model. Copyright 2011 GeneralManual.Com. All Rights Reserved. Products and names mentioned are the property of their respective owners. 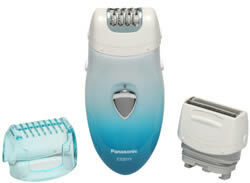 This page is part of GeneralManual.Com Network Panasonic ES2015AC Women's Shavers and Epilators User Manual.